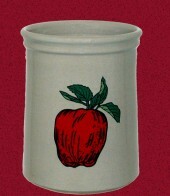 The Red Wing butter crock was originally designed to store soft margarine or butter tubs, but customers have told us additional ways they have used this decorative, yet functional piece for serving custard, baked apples, casseroles, salsa and pickle relish, and for storing candy, coarse salts or spices. Pour approximately 1/4 cup of very cold water into the base of the crock, then pack 1/2 cup (one stick) of softened butter into the cup-shaped lid. Replace the lid into the bottom of the crock. The water creates an airtight seal protecting the flavor of the butter and keeping it soft and fresh. The water should be replaced every 3 days with fresh cold water. We know how hectic life can be! Many meals are made on a wing and a prayer. 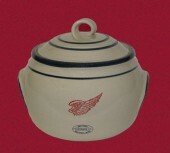 You say the prayer – we’ve provided the wing, with this beautiful Red Wing Stoneware casserole dish. This piece is sure to dress up even the most simple meal. Perfectly designed for a casserole, stew, scalloped potatoes, and meat loaf. Use this cute, open Butter Dish to serve butter or kosher salt. Add a touch of country to your kitchen with this quaint utensil holder crafted in the shape of an old fashioned cream can. Pretty as well as practical! 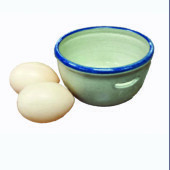 This hand thrown bowl has a crescent shaped opening on one side to separate the egg white from the yolk without the mess. These Red Wing Cream Can Utensil Holders are Factory 2nds because of discoloring, pinholing on blue rim or stray blue marks . These items will not be cracked. Item imperfections will vary. Our handy & functional Garlic Keeper will keep your garlic fresh for weeks. You can also use it as a roaster. To roast, just snip 1/2″ – 3/4″ off of the top of the bulb exposing the clove tops, then remove the loose outer skin leaving the bulb intact. Place the garlic in the base and drizzle 1 TBSP of olive oil on top. Place the lid on, put in a cold oven and heat to 325 degrees for approximately 1 hour or until garlic is tender and golden brown. This clear glass dome fits on our 7.5″ plate. 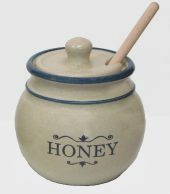 This hand-thrown “Honey” of a pot will add a homey feel to your table setting. The lid has a small opening for the wooden wand used to dip the honey. Wand included. Add freshly squeezed juice to your menu. This versatile juicer is just the right size for squeezing a grapefruit, oranges, lemons or limes. 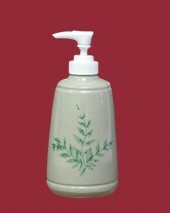 This pretty stoneware pump provides a convenient way to dispense lotions, liquid soap and detergents. This smooth, sturdy, stoneware rolling pin has lovely wooden handles. Rest it on our beautiful maple stand (sold separately), as a decorative piece or use it as a functional tool in your kitchen. Soup’s on – come and get it! This lovely hand thrown 4 Quart Soup Tureen will become a family heirloom that will be treasured for generations. Match with our soup mugs or soup and cereal bowls to create a beautiful table setting. 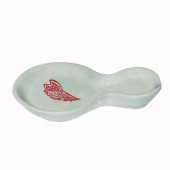 This decorative spoon rest is made from an original mold pattern of the 1940’s. 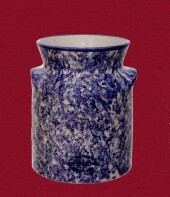 Its shape tips slightly forward to pool liquid away from the handle. This is the Bread and Butter of our gift packages! The package includes one standard hand thrown bread baker, one butter cup, one jar of jam & one bread mix. Choose either Red Wing or Birch Leaf for the stoneware items then choose your favorite bread and jam flavor. Perfect for storing your kitchen utensils in one place. It can also be used for artist brushes, or rolled hand towels and napkins.